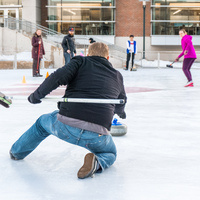 Registration is NOW OPEN for UNMC's Intramural Curling & Broomball leagues held annually at the Campus Ice Rink. Click here to sign up now! Are you an employee? Get your co-workers together and represent your department! Students? Represent your college! University pride (and some excellent T-Shirts) are on the line. Leagues are open to UNMC, Nebraska Medicine, and UNO Faculty, Staff, Students, Retirees, Volunteers, their family, and limited numbers of non-UNMC/Nebraska Medicine/UNO individuals. Click here to learn more about winter sports at UNMC. The Center for Healthy Living (CFHL) is located on the northwest corner of the Student Life Center. The parking lot is accessible from near 39th and Jones from the south and 39th and Dewey from the north. Please have your ID badge ready when you arrive! Gym members and guests will need to scan it via the proximity reader just outside of the door. Call the front desk at 402-559-5254 for access without a badge.